PARKING Public parking is available in a lot directly across Main Street from the museum. There is very limited parking behind the museum for visitors who cannot climb the steps in front. 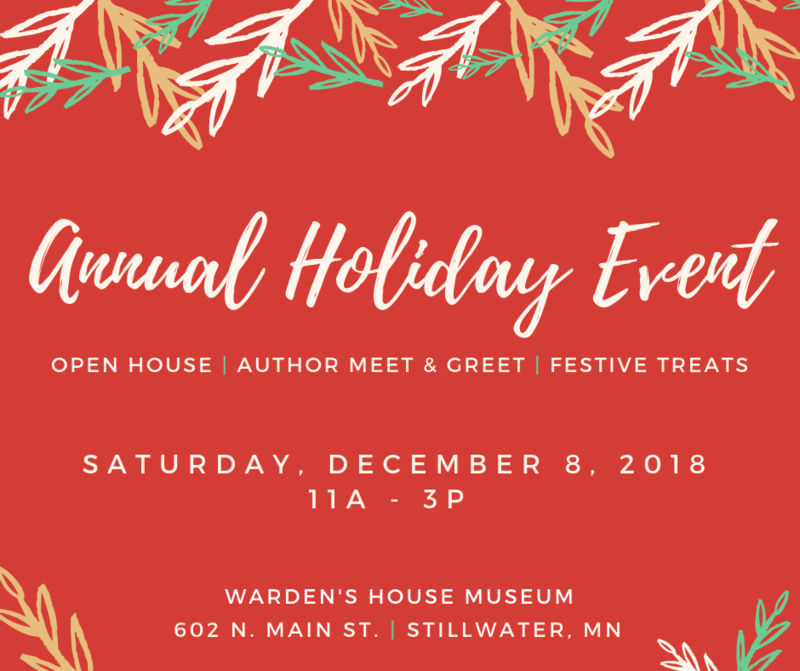 Come enjoy a truly unique holiday shopping experience while meeting local authors and shopping unique books, sipping warm beverages and snacking on delicious treats. Holiday music provided by Mary Taylor Allen’s local student musicians. Not to mention that some of our most popular titles will be up to 50% off their normal price! We’re excited to have a few new authors joining us. Lori Sturdevant, an editorial writer and columnist for the Star Tribune, has written several books on Minnesota history. Among them, “Her Honor: Rosalie Wahl and the Minnesota Women’s Movement” and “When Republicans Were Progressive.” Illustrator Carrie Hartman will have a variety of her children’s books on hand including the newest, “Where Are All the Minnesotans?” which celebrates how we make the most out of the wintry months. Mary Logue has published articles in the New York Times and the Star Tribune. She has taught in the MFA and MFAC programs at the University of Minnesota and Hamline University. She has published adult mystery novels (including the Claire Watkins mystery series), poetry, non-fiction books, and many young adult, middle-grade, and children’s books. Her picture book, “Sleep Like a Tiger,” won a Charlotte Zolotow honor, a Caldecott honor and Best Picture Book award in Japan. This year’s other featured authors Robert and Nancy Goodman (In Their Own Words, The Last Rafter, and more), and Brent Peterson (Stillwater: The Next Generation) will also be on hand to chat about their works and sign copies of their books. This is the perfect personalized gift for any fan of history!